MULTAN (92 News) – Malik Wasif Mazhar Raan of the Pakistan Tehreek-e-Insaf (PTI) won the PP-218 by-election with 46,988 votes. His rival Arshad Raan of the PPP was at the second place with 39,486 votes. After the victory, PTI workers danced to the beat of drums and distributed sweets. An excellent display of fireworks was held on the occasion. Chief Minister Usman Buzdar has congratulated Malik Wasif Raan on the victory. He said that the by-elections have proved that the people trust the policies of the PTI which is the most popular party now. “The people are with fair and sincere leadership,” he said. 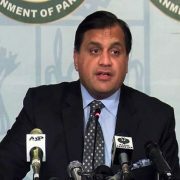 Information Minister Fawad Ch, in a tweet, said that the PTI has easily defeated a joint candidate of the PPP and the PML-N and several other parties. He said that the people are united against the corrupt coterie. Punjab Minister for Information Sumsam Bukhari has also congratulated Wasif Raan on the victory. He said that the PTI government has won the hearts of the people by launching a campaign against corruption. As many as 203,188 voters cast their votes. Strict security measures were made on the occasion. Police personnel were present in and out of the polling stations. The seat had fallen vacant after the death of MPA Mazhar Abbas Raan. In total, 138 polling stations – 25 for males, 24 for females and 89 combined, were set up for the by-polls. MPA Malik Mazhar Abbas Raan had won the seat with 45,817 votes in the 2018 general elections. PPP candidate Malik Muhammad Abbas had bagged 37,417 votes. PML-N’s Zaffar Ahmed had secured 25,000 votes.